As promised, here is the tutorial for ﻿these cute deco mesh Halloween ghosts. With inexpensive white deco mesh, black masquerade masks and white balloons create these breezy whimsical ghosts for easy Halloween decorations. Lay the deco mesh on a flat surface. Cut a piece of white deco mesh approximately 5 feet long. The longer the piece of mesh, the larger the ghost. The three ghosts pictured above are made with three different lengths of mesh. Layer another piece of mesh across going the opposite direction (form a cross shape). Cut this piece the same length as the first. Trim and finish off the ends of both pieces of deco mesh with a large irregular zig-zag pattern. Fill one of the white latex balloons with air. The balloon should be the size of a large cantaloupe. Place the balloon in the center-cross point- of the mesh. Gather up the first piece of mesh around the neck of the balloon and hold. Gather up the second piece of mesh. Hold in place. Tie a piece of the 2.5" orange deco mesh ribbon around the neck of the ghost to secure. Cut an addition loop of ribbon approximately 3 feet long. Create a big loop and tie into the ribbon on the neck to form a bow. The fun part is creating a mouth for your ghost with a black pipe cleaner. Bend it in half and form it into what-ever silly mouth shape you like. We created three different versions on our ghosts featured above- pick one you like! Attach the black mask and pipe cleaner mouth to the ghost head with your preferred type of adhesive. We used glue dots. Depending on the weight of your mask you may need additional adhesive. 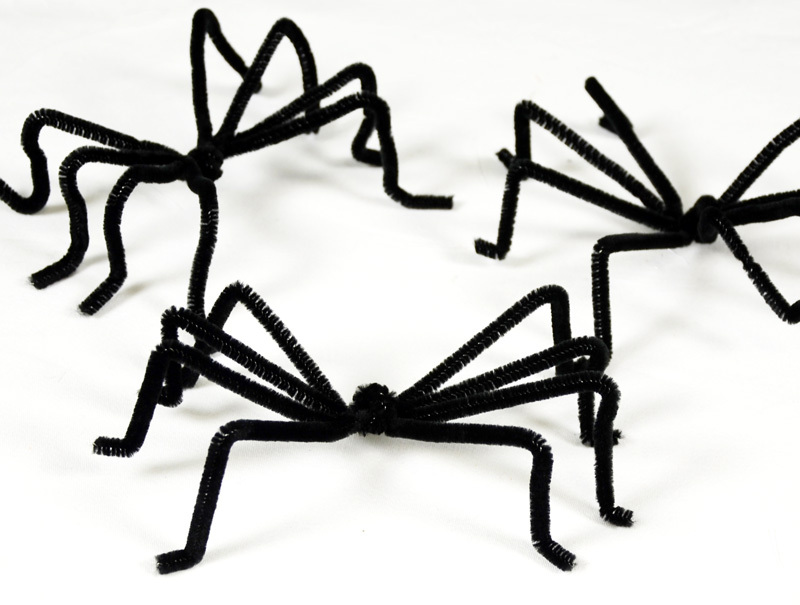 Each of our ghosts has one of these cute spooky spiders! Twist four black pipe cleaners together in the center as shown. Bend each of the 4 legs on each side into a V shape to make the spider legs. Wire, mono-filament or string tied to the top of these whimsical ghosts allow you to hang them indoors or out. The deco mesh is weatherproof ! I like your fun ghosts....they are not scary-looking. Thanks for the tutorial! Its definitely a kid-friendly craft project. Thanks for commenting Miss Kitty!